Starring Ben Stiller, Austin Abrams, Michael Sheen, Luke Wilson, Jermaine Clement, Shazi Raja, and Jenna Fischer. Brad has reached his mid-forties. He’s comfortably off, has a happy marriage and now his teenage son is on the brink of choosing an illustrious college. But when he looks at what his old college friends have achieved, he feels he’s a failure. At first glance, the title points to another film about social media, following in the footsteps of Ingrid Goes West. But, for a change, the word “status” is being used literally. 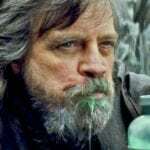 In Brad’s Status, writer/director Mike White (who also has a cameo role) takes one moderately successful middle aged man who is, as his parents might have said when he was younger, “going through a phase”. The one where he wishes he was somebody else, somebody in his class who seems to have it all. Most of us grow out of it. Brad Sloan (Ben Stiller) hasn’t. In his late forties, he’s increasingly obsessing about how his contemporaries from college have gone on to successful, lucrative careers with all the trappings that go with them. He hasn’t done badly himself, with a company of his own in the not-for-profit sector and a comfortable life with his wife and teenage son. So what’s the problem? It’s twofold. 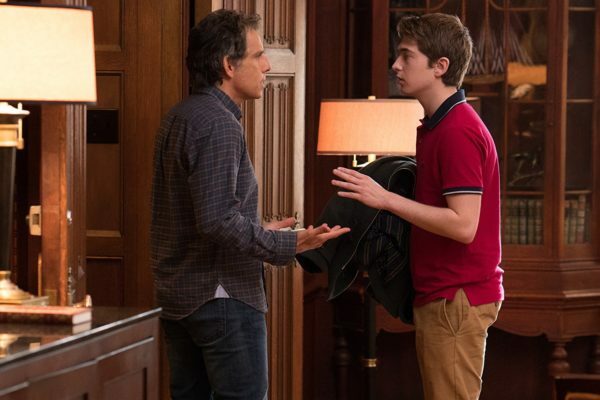 First there’s his dwelling on what he sees as his constant failures – he can’t even get an upgrade on a plane, even if he’s willing to pay for it – and it’s all prompted by a visit to Boston for his teenage son Troy (Austin Abrams) to check out the various colleges available to him. On a larger scale, he also seems to be struggling with a form of mid-life crisis. No motorbike for him, but constant thoughts about how he’s failed compared to his former friends or, at least, his perception of them. Even Troy can see his dad is deeply troubled and asks him if he’s having some kind of nervous breakdown. It’s not as dramatic as that but, unlike Troy, the audience gets to hear all of Brad’s thoughts and inner insecurities as they provide the narration to the film. The irony is that, in many ways, the young people surrounding him are a heck of a lot more mature than the so-called adults. Most perceptive of all is Ananya (Shazi Raja), a musician friend of Troy’s and a Harvard student. Brad finds himself pouring out all his dissatisfactions and disappointments to the confident, intelligent young woman. For hours. Her eyes start to glaze over as she realises there’s no escape – until he asks her what she thinks and she voices what we’ve all been thinking. Does he know any genuinely poor people? Poor like her relatives in India who don’t know where their next meal is coming from? He doesn’t know how lucky he is! And she’s right. He doesn’t. Which makes him, in his self-obsessed state, difficult to like. Yet Brad’s so caught up in his own little world that he can’t see outside it and that’s part of the reason he’s lost touch with his former friends and isn’t invited to any of their social gatherings. His daydreams are portrayed with just the right amount of exaggeration, so that they mimic the lifestyles of the three men he envies so much. 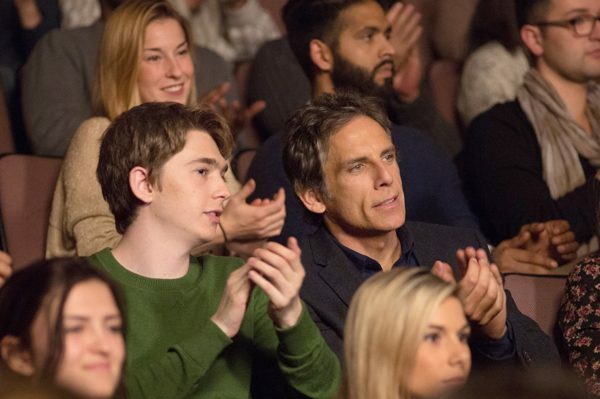 It helps make him more sympathetic, as does Stiller being on very likeable form. We may grow older, but do we grow wiser? Debatable. Do we change? Not as much as we think we do. Do we ever learn? Up to a point. But neither we, nor the film, have all the answers and never will. Nobody said life would be that simple, after all. 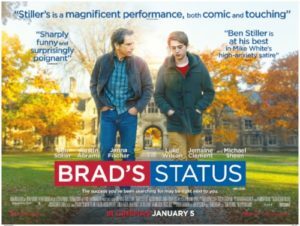 Brad’s Status isn’t a film with instant impact, but one which quietly lodges itself in your mind, leaving you to take your time thinking about it afterwards. And, if you’re of an older persuasion, you’ll start to draw parallels between yourself and Brad. Which makes it an uncomfortably accurate watch.